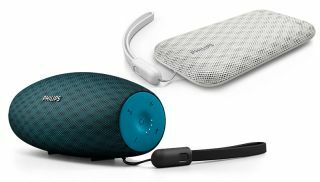 Philips launches EverPlay range of Bluetooth speakers | What Hi-Fi? Dustproof and waterproof, the BT3900, BT6900 and BT7900 Bluetooth speakers have 30m Bluetooth range and USB cables that double as carry-straps. When you're taking them out and about, Bluetooth speakers need to be world-proof - able to survive dust or water while still delivering great sound. Philips hopes its new EverPlay range of speakers, originally announced at CES 2017, will do just that. There are three models: BT3900 (the flat white device in the pic above), BT6900 (the bigger, blue speaker), and BT7900. Each has a 30m Bluetooth range and a IP57 shockproof, dustproof and waterproof rating - so they should be able to survive the day-to-day ordeals of being portable. The BT7900, the most powerful in the range, has two front-firing neodymium speakers and a 100-hour battery life (while it's on standby - it has 10 hours worth of battery power when you're using it). It also has a built-in microphone for hands-free phone calls. The BT6900, though it looks similar, only has one front-firing speaker. The smallest speaker, the BT3900, has a 5cm full range driver and a passive radiator - just like the BT6900 - and a battery life of eight hours. The BT3900 and BT6900 also have carry straps that double as USB cables, which is a neat feature. If you want to get your hands on these speakers, they're available in July. The BT3900 is £50, the BT6900 £80 and the BT7900 is £90. aptX HD Bluetooth: what is it? How can you get it?